"When it comes to the future, there are three kinds of people: those who let it happen, those who make it happen, and those who wonder what happened." -- John M. Richardson, Jr. quotes. The last snow birds are heading off to the Northern Hemisphere, leaving behind fond memories and people who are sorry to see them go. We hope they all come back soon. So now we are the full-timers who get together in Montevideo every Sunday at 14:00 (2 pm), but we have plenty to talk about, so come join us at La Papoñita for food and fun. 1. Next week, it's the Semana Santa (Holy Week) or Tourism Week, depending on who you talk to. At the very least, you need to plan for it, because lots of places will be closed all week so the staff can take off on another holiday. 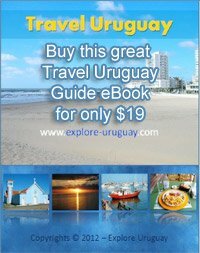 Uruguay is reputed to have more holidays than any other country. Offices, particularly government places like the Registry, will be closed all week, while banks and everything official will be closed on Thursday and Friday. And then, of course, it will be Easter. There is a rodeo type event in Prado and some other places, where wild horse riding will be featured. And many churches have lots of things going on, too. 2. Music--And this time for something completely different. Since a lot of events that have been brought to your attention are of a classical nature, and since there are those who prefer other types of music, this time events of a different nature are spotlighted. 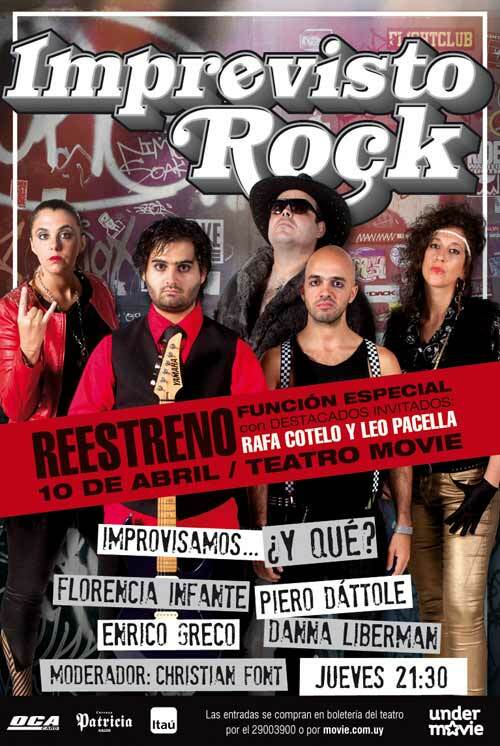 b) Imprevisto Rock is a Uruguayan Rock band, and their big performance is already April 10th, Thursday evening, aka tonight (if you don't get this until Thursday), at 21:30 (9:30 pm). c) There are a couple of International Jazz Day concerts at Solís on April 30th. d) Solís also has dance & other things. 3. A couple of Lovet Birds need some help: She (Sue) was offered a once-in-a-lifetime opportunity to serve as a personal chef at the Korean Embassy in Montevideo, and they thought they could deal with a 3 year separation. They have discovered that they were wrong.... So now he (Robert), a 28 year old chef at the Hyatt Regency in Rochester, NY, is desperate to come to Montevideo so they can spend the time together. what we can make happen. Let me know your ideas, leads, and perhaps a spare bed you could offer, at least so he has a place to go until he gets on his feet. our well-being are not available there. I have celiac disease and the gluten free options (all I found was made from manioc and it gives me diarrhea!) need expanding. These few items will sell like wildfire, I guarantee you. IS THERE ANYONE IN THE GROUP WHO WOULD CONSIDER BRINGING BULK AMOUNTS OF THE FOLLOWING IN? * Sea Salt is necessary, as fluoride-laden options are totally bad for health. I will try to bring in several pounds of Himalayan Pink Coarse mineral salt, (under the guise of "bath salts") but am not sure I will succeed. My boxes of supplements will be "prescribed" by my naturopath, but I'm still afraid they will confiscate some of my herbs, etc., without which I will suffer. * Virgin Coconut Oil: so I heard that one place was carrying small jars....since the news that coconut oil's good for brain health and can actually reverse Alzheimer's, I would think it would catch on quickly there as a preventive and delicious remedy. Has a rich, brown sugar taste and is easy on the uptake so doesn't spike blood sugar as cane or sugar from beets. * Better and more gluten free choices, such as organic flour beyond the widely available brown rice flour (ideally made from sprouted grains) from millet, quinoa, buckwheat, amaranth, coconut, etc. * Raw goat's milk and cheese: does anyone know of a goat farmer? How many goats/ How much milk could be produced? * A Compounding Pharmacy Many of us rely on Supplements such as natural thyroid support (Armour or Naturthroid vs. Synthroid, which is a patented drug with harmful side-effects) and bio-identical hormones (I can't SING without them--keeps tissues from atrophying, so this is a career life support! So what about it? Maybe two or three could get together and get something going. If you are interested, let me know, and I can put those interested in contact with each other. Which covers enough for this week.